CME Inc. is your One-Stop-Shop! From out in the field, to on top of the scaffold, we have, can make or get what you need. Have a custom design and a idea in mind but not sure where to start? Speak with any of our professionals! Personalization and quality customer care is what we excel at! 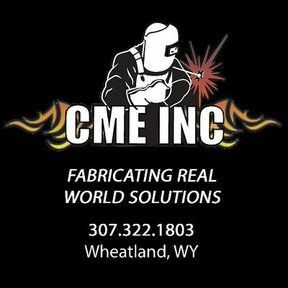 CME, Inc. started as a welding shop in 2002 and over the years have been serving the many industries of Wyoming and surround states with a variety of products and services. Currently, we have: Welding Fabrication - Custom Machine Shop & Plasma Cutter; Mobile DOT/Non-DOT Breath Alcohol and Drug Screening; Marketing & Promotions; Custom Screen Printing & Embroidery and an Industrial Retail Store. Stop in and see us at the store! We have a wide variety of services to offer! Welding Fabrication, Retail Store, Machine Shop, Mobile DOT/Non-DOT Breath Alcohol and Drug Screening, Custom Screen Printing & Embroidery and much more!!! Call if you have any questions!! !